Des Moines Half Marathon, 2008. For the next several years, my dad ran marathons. I don’t know right now exactly how many he did, but I’m sure between marathons and half marathons, he did at least ten. That was an example for me. Running a marathon seemed like a normal thing to do (until, of course, I started training and realized it really is a crazy thing to do). So, when I started college and realized that I probably need to exercise once in awhile, running seemed like the obvious activity. My first run was a mile and I was out of breath and sore for days. It was so hard. But I kept at it. 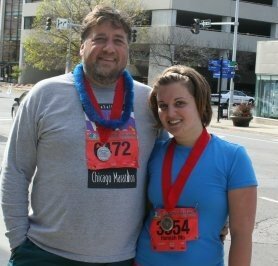 If my dad could start running at more than 100 pounds overweight, I could run too. The day came for the race. My dad had not trained. He had been in Des Moines the day before and picked up our race packets. We left Iowa City at 4 am listening to some weird radio show about ghosts and paranormal activity. We started the race together and within the first mile my dad told me to leave him. I did the next 12 miles and felt good, I ran the whole way (that was really my only goal for the race). When my dad picked up our race packets, he “accidentally” switched the chips, so my official time for the race is his time–more than an hour behind mine! Eleven days ago my dad died suddenly. I miss him. But I’m so grateful for all the things I learned from him, including my love for running. I’m glad I did my first race with him, even if he did switch our chips. I’m glad that the first voice I heard when I crossed the finish line at my first marathon last October was my dad yelling “I’m proud of you, Hannah!” As much as I hated all the gross sweaty hugs he so loved giving me when he came in from long runs on weekends, I will miss them. Among the other things I will be taking back to DC with me this week, I have all of my dad’s medals. I am so so sorry to hear about your loss. You and your dad had a special bond and I love that you have running to still share with him. Surely he will be there smiling as you continue to run and race. Sending hugs your way.